Welcome to another edition of DroidLessons.com’s “Android Apps of the Week!”. The plan is to compile a list of my favorite apps and share them with you on the Sunday of every week. It will give you plenty of time to try out the apps and then also something to look forward to on a weekly basis. It’s always fun to learn about the latest and greatest apps out there. The Android Market (now known as Google Play) has over 600,000 apps and therefore it’s not always easy finding quality apps via the Android Market. My hope is to save you some time by sharing and informing you of the quality apps that I have found over the many months of using and teaching on the Android platform. So, without further ado, I present to you this week’s edition of “Android Apps of the Week!”. 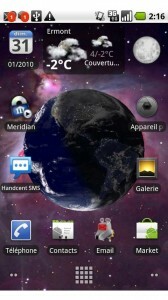 Earth Live Wallpaper is one of the most beautiful Live Wallpapers available on the Android Market. This app allows you to set the background of your device as a live wallpaper of various planets! The default, and my favorite, is the image of Earth rotating. But you also have the option of setting it to any other planet in our solar system (along with some fictional ones from the Star Wars universe). How awesome is that? !